On the showroom floors of BMW Australia there are arriving a new fleet of very special flagship BMW 7 Series cars. Not a true M7, but getting a whole lot closer, the BMW M760i xDrive goes like a sneeze and has AWD grip to match the exquisite power and torque of the V12 TwinTurbo. You still have the best comfort on offer and a range of new and exciting technology to make the journey special. Let’s get down to talking about the superb engine. The M Performance TwinPower Turbo 12-cylinder gasoline engine in the new BMW M760i xDrive is a 6.0-litre that develops 450 kW. Torque is immense and the M760i puts down 800 Nm of torque from 1500 rpm. AWD traction controls this thrilling performance, enabling the large, luxury sedan to sprint from nothing at all to the legal road speed limit in around 4 seconds. BMW actually claim 3.9 seconds! This is a figure I’d associate more with a Porsche 911.A launch control system enables any driver to access the immense acceleration straight off the mark. Governed to top speed of 250 km/h, I imagine at this speed the M760i V12 is just ticking over! With an array of special technical features like TwinPower Turbo technology, High Precision Injection, throttle response refinements, a linear torque curve and exceptional efficiency to match the outstanding performance, the new V12 already leads the charge for premium luxury limo. There are two turbochargers -one for each set of six cylinders. These breather very easily and add all the power behind an impressive M sport exhaust system that delivers a stirring V12 soundtrack. Extra smooth power delivery comes from the 8-speed Steptronic Sport Automatic transmission which can be adjusted along with the chassis via the Driving Dynamics Control switch. Paddle shifters are present for the driver to change gears at will. Modern technology and advancements has BMW engineers using an intelligent lightweight design employing high-rigidity and lightweight carbon-fibre elements in the passenger cell’s Carbon Core structure. 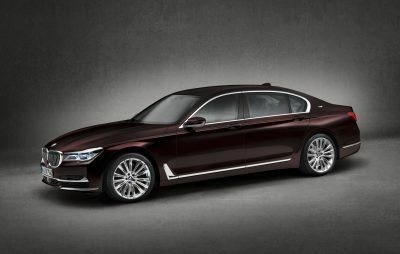 This technology has helped keep weight down but also enabled the BMW M760i to retain a low centre of gravity. The all-new BMW M760i xDrive is fitted with exclusive 760M 20-inch M light-alloy wheels that have 245/40 R20 Michelin rubber on the front and 275/35 R20 Michelin rubber on the back. xDrive technology gives the big M760i loads of traction under hard cornering and acceleration. An Active Comfort Drive system with Road Preview is an active suspension control system that links up with two-axle air suspension and the Dynamic Damper Control systems to deliver extraordinary spring and damper comfort. Active roll stabilization is carried electromechanically and allows body roll forces to be cancelled out. Boasting the M Aerodynamic Package you can bet your bottom dollar that the M760i is a truly gorgeous work of art. The front grille is large and bold, as are the grander air intakes. The sporty M design at the rear highlights the M sports quad exhaust system with Cerium Grey twin tailpipe styling. 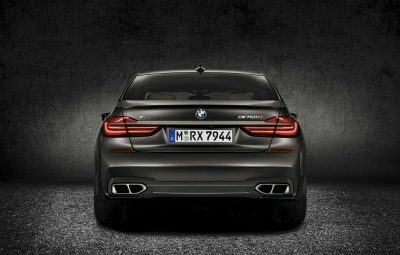 An M rear spoiler optimizes the flow of air, while the trunk handle strip, which links the L-shaped LED rear lights, the model badge on the right-hand side of the trunk lid and the xDrive inscription on the left carries the performance potential of the BMW M760i xDrive in lettering – probably more for onlooker’s interest. 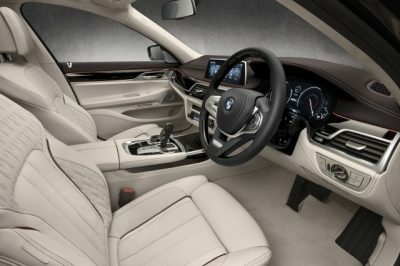 Inside the BMW M760i xDrive there is absolute luxury at its finest. M accents are situated about the cabin, Fine Brushed Aluminum door plates with an illuminated V12 logo, an exclusive M leather steering wheel, multifunction buttons on the steering wheel are finished in Pearl Gloss Chrome, M pedals and M driver’s footrest in stainless steel with black rubber inserts and other areas which display the V12 badge. Leather and trim options are available. BMW ConnectedDrive can use Smartphone applications and SIM cards to better personalise the BMW experience. You can keep ahead of the time by using BMW’s advanced real time traffic information navigation system. BMW Head-Up Display has the latest optimized graphics with a larger projection area. At the centre of the dash is an iDrive 5.0 system with touch display and Gesture Control. One area that the new BMW 7 Series has worked on is that of passenger comfort and entertainment. Even those in the back seats have massage heated/cooling seats and a touch control screen at the rear for controlling things like the DVD, volume and zoned climate control features. An optional Bowers and Wilkins Diamond surround sound system offers outstanding studio-quality sound inside the vehicle, and those with a musical ear will find this system very hard to fault. Sixteen speakers with a total output of 1,400 watts provide a sensational sound. So there we have it in a nut shell, BMW’s brand new athletic M Sport M760i xDrive. For any more information on the BMW 7 Series models or, for that matter, any other new car, contact one of our friendly consultants on 1300 303 181. If you’d like some fleet discount pricing (yes even for private buyers! ), we can submit vehicle quote requests out to our national network of BMW dealers and come back with pricing within 24 hours. Private Fleet – car buying made easy!